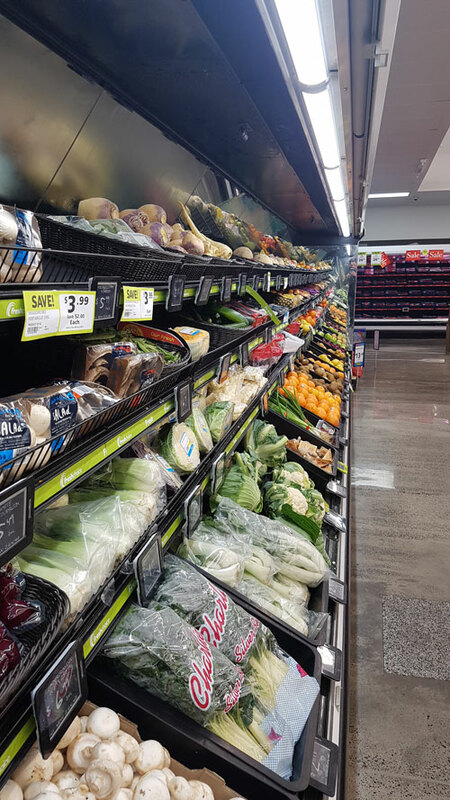 The Otahuhu Freshchoice store has had some major upgrades; including polished floors refurbished shelving, new electronic product label displays and high brightness LED Lighting. The store now has a modern, bright feel with its recent installation of efficient lighting and shows the care and passion the owners have for the industry. The Chiller Lighting was replaced in all dairy, fruit and vegetable chillers. Removing the old inefficient dual 36W T8 tubes with our LU Linear Batten Lights meant less maintenance, higher brightness , lower power consumption; in both power draw and due to less heat generated in the chillers - so they are not working harder to compensate for excess heat produced by traditional fluorescent tube lighting. The old ballasts in the top cavity were another maintenance issue, with additional parts to fail and additional power used just to keep the fluro tubes operating. By installing our 40 Watt surface mount LU Linear Batten lights, they not only produce a higher quality and higher brightness light, it meant they could be surface mount between the shelves, and remove the bulky power hungry ballasts in the top cavity. Each 40W LU Linear Batten light replaced 2 x 36W T8 Tubes + the magnetic ballasts which used an addtional 15 Watts. Not only did we half the power usage and produce a better light, we halfed the amount of heat generated in the chiller! That saved additional power used up by the refridgeration units just to compensate for the tube lights. The Ceiling Panel lights were also replaced with slim-line LED panel lighting, giving a diffused constant light rather than patchy tube lights that give a very uneven light especially when one tube is older than the other. The Correlated Colour Temperature of 5500K gives the store a bright modern feel, adding futher to the extensive renovation.